We have two squash blossom seasons around here. The first is in June and then they appear once again in late September. They are funny little flowers. They grow hidden beneath the leaves of squash plants and only open early in the morning. If you don’t catch them at sunrise, they close back up and go to sleep. We handle them as delicately as possible, so as to not crush their delicate petals. Once picked they need to be refrigerated immediately, but not too cold, and they would prefer a wet paper towel nestled in with them. And, after all of that, if you don’t do something with them soon, they will wilt and break your heart. 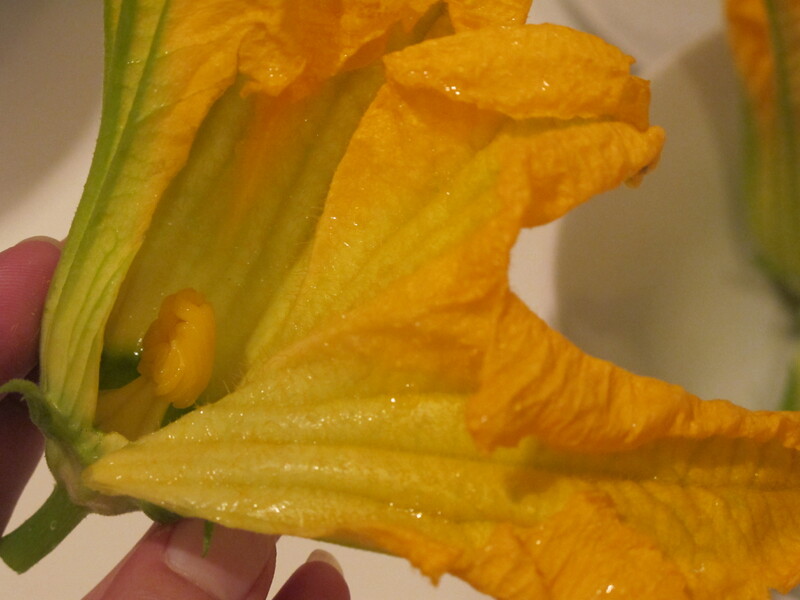 Squash blossoms are the subject of a lot of curiosity. They are seductive and confusing all at the same time. Pretty and edible? In Mexico they are called flor de calabaza and are used in soups or quesadillas. In Italy they are fiori di zucca and are stuffed with ricotta, served with pasta or made into fritters. We work with a number of chefs who have come up with their own interpretation of what to do with them. I have tried many and have found them all enjoyable. 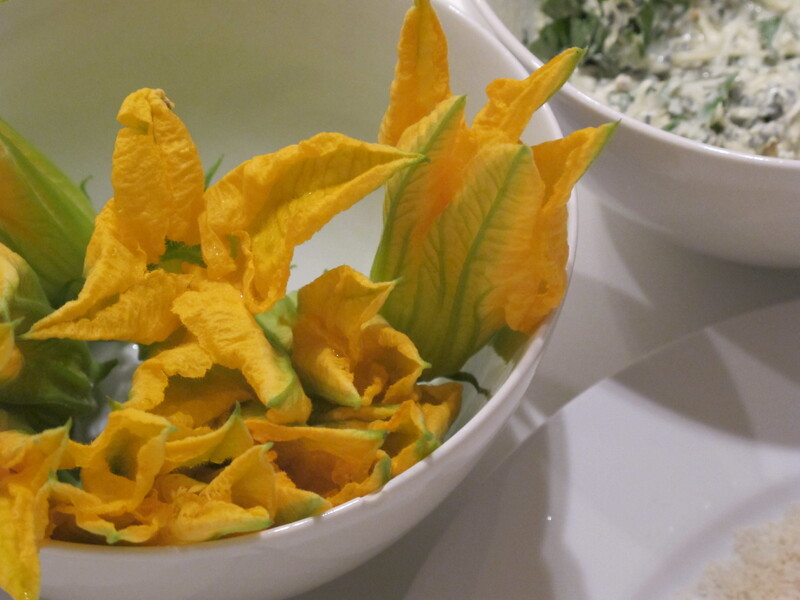 But my favorite way to eat squash blossoms is in Marsha’s kitchen. She showed me what to do a few years ago, and after a lot of practice, mine still pale in comparison, but I am no longer intimidated. Here’s the deal, you can really stuff them with just about anything. I have filled them with all sorts of things, mozzarella with lemon zest and basil, spinach dip with artichoke hearts, sauteed squash with parmesan and pine nuts. 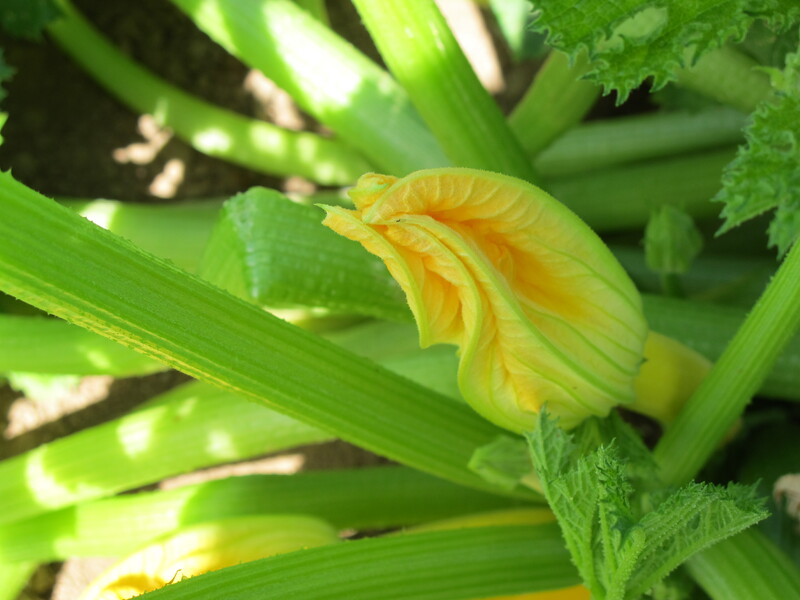 The female blossoms come with a little baby squash attached that I like to saute along with the flower. Really, you can’t mess them up, or I am sure that I would have by now. 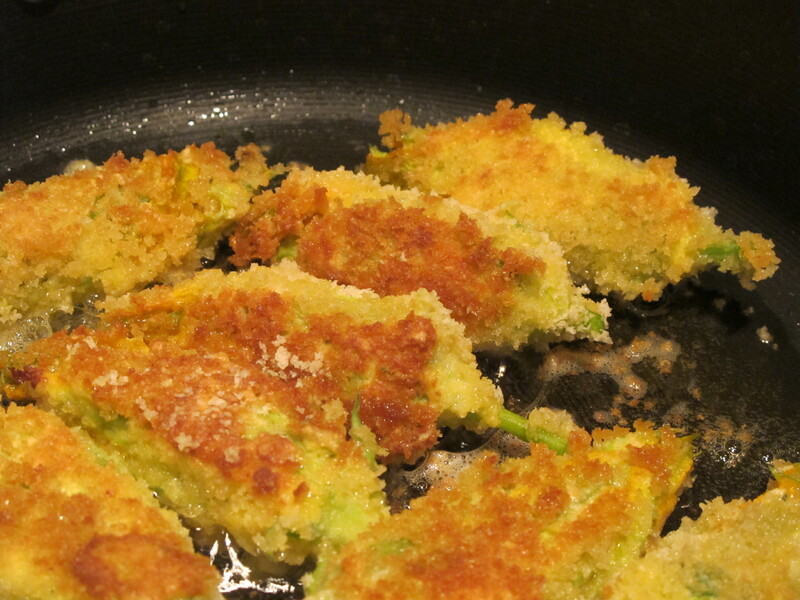 So… what should you do with a squash blossom? Well, first gently rinse and pat dry. I make a small cut along the side and then remove the stamen from the middle. I then put about a spoonful of whatever I am using, in these I had a spinach dip with some parmesan and fresh basil. The ends of the petals are then twisted closed and the flowers are rolled in flour, then an egg wash and some panko crumbs. They were then pan fried with a little olive oil over medium heat for about 2-3 minutes per side. Just long enough for them to turn a golden. They are so good… and will soon be so gone! Their season feels as delicate and fleeting as they are, but it is so worth it. If you really want a treat and want to go the distance for a squash blossom, next summer plan to take a trip to Winslow. John Sharpe at The Turquoise Room in the La Posada makes a squash blossom tamale that is well worth the drive!